How am I supposed to be a mom who keeps humans alive all day, stays up all night with a baby, and focuses on living a healthy lifestyle? That sounds so overwhelming! Wellness, exercise and eating well should work with you, not against you. It all should fit into your life, not overwhelm you! And wellness looks different from season to season.We cannot put a standard on wellness that we expect to work in every season of our life. If we focus on obsessing over wellness we are putting more stress on ourselves, our kids and our husband because we are trying to squish a certain standard into something that's not going to fit. Amanda Wilson is a well of wisdom when it comes to the mom life version of exercise, health, fitness, wellness and carving out that time for yourself. She strives to help others relieve the pressure of a wellness by sharing simplified approaches to living a healthy lifestyle. Common misconceptions about a healthy lifestyle. Simple healthy meals for families. The difference between food prepping and meal prepping. The importance of being aware of your capacity during the different seasons of your life so that wellness and healthy living work for you, not against you. You are barely getting through your days friend? Does motherhood feel more like a hurricane of chaos that you are just surviving rather than the awesome, joy-filled season that you want it to be? ALLIE: Hey ladies! Welcome back to another episode of The Purpose Show! We have a guest interview today with my good friend, Amanda Wilson. I think this is the first time that I've had you on for my whole audience. You were a Purpose Society guest, right? Amanda is a well of wisdom when it comes to the mom life version of exercise, health, fitness, wellness and carving out that time for yourself. I think my favorite thing about you (and you guys will see this if you follow her on Instagram, which you absolutely should and I'll link to that in the show notes) is you are very gracious and realistic. It's nice to have a fitness feed on my Instagram that's modest and classy, so thanks for that. If you're looking for somebody to follow when you don't want to have to hide your phone when your husband or your son walks by, Amanda is the one. Tell us about yourself, your family and what you do. AMANDA: Yes, so I am married and we have two biological boys and we are foster parents as well. I call myself a temporarily retired RN. I used to work full time as an RN until I stayed home with my kids. I still keep my license and one day might go back to it, but towards the end of my time as an RN, and my time as a mom, that's when the health part of my RN side, medical and health, came together in realizing what I put in my mouth and how I'm moving my body affected long term. ALLIE: Did you find yourself thinking about that because of the patients that you saw? AMANDA: A little bit, I think. I did have a background growing up. My mom was pretty health conscious in a really balanced way. When I started practicing as an RN, I was a cardiac RN and so most of my patients were older and a lot, but not all of it was lifestyle. I did get to see that what I'm doing now with my body will matter later. And then whenever I was talking to my patients about changing their lifestyle habits, how they move their body, what they put in their mouth, I realized that this is what needed to change. But they were extremely overwhelmed by that because it seemed like an overhaul of their “normal” and they were already super overwhelmed with their sickness and illness. But I realized that I really enjoyed educating people on it and that it wasn't just about how you looked, which was an awesome benefit. Then I thought, “Oh I will create an Instagram account and if people want to they can follow me there.” And it was a little side thing that I enjoyed doing while being a stay at home mom. ALLIE: Yeah. And you're so good at it. And just the way that you are as a person, as I've gotten to know you a little bit more since I came across you there, you're just really mellow. And that is a comforting thing. I think the overwhelming thing for mothers is that you eat so much during the day, like you have to eat so often. I think that's the first thing I'm going to ask God when I die. Like why though? Why do we have to eat so often during the day? It’s really kind of a pain. That's why it's so overwhelming to change it. It's not just like, you know, “oh, I can take a walk once a day.” It's like, “I have to deal with this 3-5 times a day and I don't even know how to do it right and that’s overwhelming. We were talking a little bit about this before we hit record, but I think a lot of the time mothers feel extra overwhelmed and since that's mainly who our audience is, I wanted you to speak to that. As a mom, you're taking care of other people. You've got all this stuff on your plate. You already have enough. What you said about what you're doing with your body and what you're putting into it now matters in the long run. How can you speak to that? I think it can bring a little bit of fear, because we feel like we don't have what we need in terms of time, energy, resources and maybe money to do that. I don't want this episode to put fear into people. I love that about you; you don't do that in the way you talk about it. It removes that. 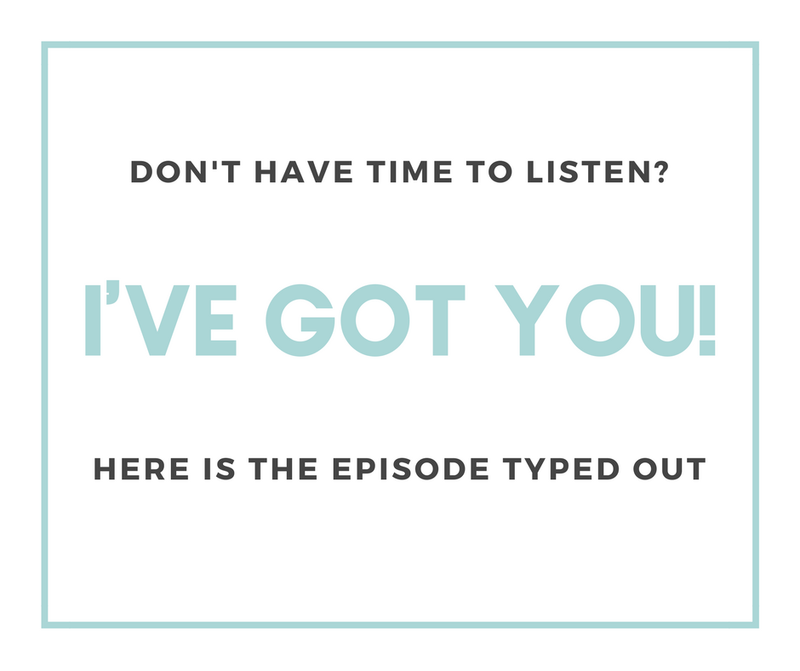 So if you can maybe just speak a little bit to the overwhelmed mothers that are listening that want to be healthy long-term, but just feel like they don't have what it takes right now. AMANDA: Yeah. I think it can feel overwhelming because you're already having to keep other humans alive. And like you said, it's something that you have to deal with multiple times a day. And then on top of it, apparently I'm supposed to exercise and how am I supposed to do that if I'm up all night with a baby or I'm just truly trying to survive myself and try to keep my eyes open? And I think another reason why it can be overwhelming is because we think there is a certain standard to how we're supposed to do it. That being healthy is making everything homemade and it's bland and it's boring and I have to work out several hours a day to be healthy. And so, I always tell people, and it's something that I learned is that wellness does not have a standard necessarily at all, but also to take your season of life into consideration. I always tell people healthy does not have to be everyone's hobby because I think they think that when you're pursuing healthy, you all of a sudden have to be obsessed with it and go to the gym all the time and talk about it. It doesn't have to be your hobby, but it is your responsibility. And the responsibility looks different in every season of life and so that will require constant reassessment. I think it's really important to be aware of your capacity at that time of your life because if you think healthy is what that girl is doing, whoever that girl is, that because you want to look like her, you want to eat like her or whatever, and you try to apply that to your season of life, if you guys are not in the same season of life, it may not work for you. So therefore, you're putting more stress on you, your kids and your husband because you're trying to squish a certain standard into something that's not going to fit. I feel especially too, when you have young ones or even kids in general, seasons of life change really quickly because kids change really quickly. I think it's always reassessing and being aware of what you can do. Like I said, wellness or being fit or healthy is not necessarily going to the gym for two hours a day. Some people can do that in certain seasons of life and they might really enjoy it, but that's not always the case. In the past two years I have gone from my cardio was taking my kids on walks and strength training was at home with a few different weights, with babies climbing on me. Then it got to the point where I wasn't nursing anymore so I had a little bit more freedom to leave the house, so now I work out early in the mornings before my husband goes to work. It's always being aware of your capacity and pursuing wellness with excellence within that season because then you're going to be able to enjoy it more and you are going to be content knowing that you are giving your best in that season. I think that's why people get overwhelmed because they're constantly looking to the right or the left and they're like, “Well apparently she went to the gym for an hour. She made this. She prepped every single meal all day long for whatever. And I'm not doing that. I'm not healthy.” It just becomes overwhelming. I think that's why people pursue it really hard for a week and then they fall off, you know? And they go through this constant cycle of “I'm going to be healthy. Oh no, this is too much.” It’s always an unrealistic thing. People think being healthy is unrealistic and it's because of those things. 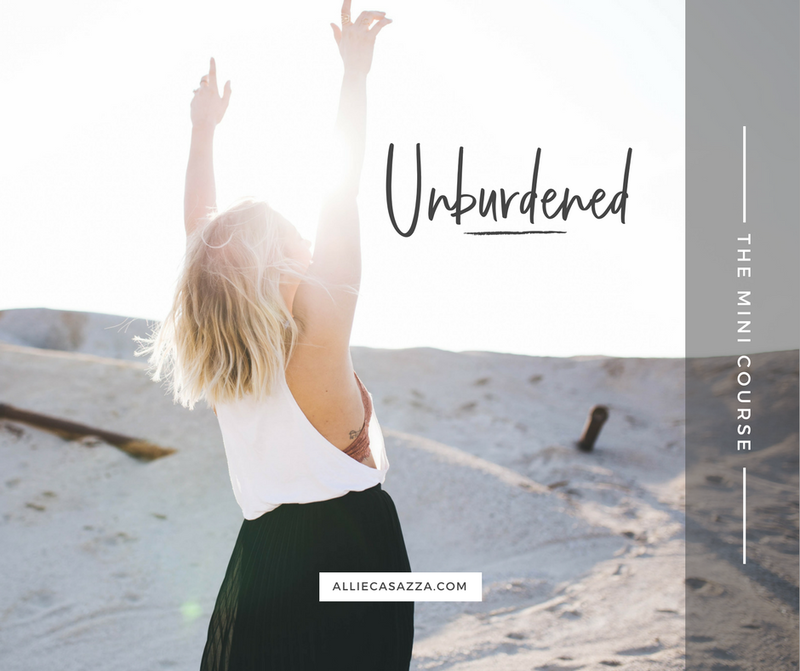 ALLIE: And I think that what you said about maybe the comparison thing and also that your health and wellness has to be up to a certain standard and then it can't ebb and flow with your season of life is probably one of the most misunderstood things for women, and moms in particular, about health and wellness. It's the comparison thing. Maybe you don't even realize that you're comparing but you subconsciously dogged yourself for not doing this. I think it's really important to hear you talk about that “little babies” season of life and then up to a little bit older and how it changes. I think not even just with your kids' ages, but with your schedule. What if you have to go back to work all of a sudden? You need to make it something that you enjoy doing. I do not like working out; I like what I feel after. I've tried for a while. I’ve let go of the trying to find something I like. Now I am just, “You know what? It feels good to take care of myself. And that is what I like.” I don't really love any particular thing. I think accept that and make it about taking care of yourself and living a healthy life. Letting it be simple when it needs to be simple and letting it be more when it needs to be more. Committing to 10 minutes. And then who knows? Maybe it'll turn into 40, you just don't know. But just making time for something. AMANDA: Yeah, I think that's so good that you said it that way. If you can come to terms with you don't know if you’re actually going to really enjoy a certain method of working out, but you love taking care of yourself and wellness. I think over all of this, the mindset is what's going to carry you and sustain you. Because having goals, whether it's a weight goal or a strength goal or whatever is totally fine and great, but it cannot be your motivation because those things will fall off of the priority list. All of a sudden you won't be motivated because it seems too far-fetched. I would say that you have to have healthy mindset and something that's grounded in purpose and grounded in something that's lasting. I always talk about stewardship. That your mindset has to be the fact that you are the caretaker and the manager of your body. That I am given one body to live this life, mom life and I'm going to steward it well so that I can do the roles that are set before me really well without avoidable barriers. There's certain things about our health we can't control at all, but what we can control, steward that well and do that with excellence. ALLIE: Yeah, I love that. Okay. If there was just maybe one thing that a mom who's overwhelmed and maybe in a particularly busy season could do to just start, like start feeling better? I think this is one thing too. I think we don't realize that if you just focus on the wellness, like you said, and you let go of that bathing suit goal or that toned thighs goal, it's going to come if you're focusing on wellness. If you take the focus off the “I'm not this, I want to be that,” and you just focus on wellness, that's how you get there - by being well and making “well”choices. It's funny how we sabotage ourselves in that way. But having said that, if there was one thing that a mom could focus on and started to track her health and get on the right track, what would you say that would be like? Step one? AMANDA: Yeah. Well to that question first I always say our goal, our overarching goal for most is for wellness to become a lifestyle because we don't want to always have to be trying so hard. So, pick one thing a month or whatever your timeline is that you feel like you can have the capacity to do. Or pick one thing for three weeks and do just that one thing and literally don't worry about any other aspect of wellness until you feel like you're comfortable with it and mastered it. Then you can move on. That can look different for everybody. It can be literally as simple as water intake and then the next thing be like, “Okay, I've done that for three weeks, now I'm going to focus on breakfast only” and don't worry about the other meals. Just do that. But I think as far as it becoming a lifestyle too, is just learning to love real food because if you don't ever learn to enjoy it or love it then it's always going to be a fight. I call myself kind of a foodie. I love food. I like good food and I'm not going to eat something if it doesn't taste good. For that part you're going to have to allow yourself time for your taste buds to change. And I'm not saying you're going to have to learn to like something that's gross. You're just going to have to give yourself some time to learn to love real food. And the reason why we love the certain things we love now, whether it's processed or whatever junk food, is because we grew up on it or we learned to like it. I just told somebody today the reason why other people in other countries like certain foods is because they grew up with it and we would like their food too if we did. Learn to love real food and that's going to take time. So maybe you focus on learning to love real food at breakfast. Or pick your hardest meal of the day, that's the hardest to eat real food. Or maybe it's the time of the day that you are the weakest as far self-control and pick that. Do that for three weeks or a month until all of a sudden you feel your taste buds changing, your habits changing, and then you can add something else to it. You can apply that with any little goal. But if you don't ever learn to love food that's nourishing your body and fuels your body, then mealtime will always be a fight. You just can't sustain it if you're always fighting cravings and your norm or whatever. Allow clean eating or whatever to become your normal, your default. ALLIE: That was really profound. So, this just popped into my head. It's kind of a selfish question, but I'm sure that people are thinking it. So, my biggest thing has always been (and we talked about this when you did my coaching call with me) late night snacking. Back in the day, when I was doing whatever and I was a lot heavier. I would want drive-through food. It’s the end of the day, the kids are in bed, I'm hanging out with Brian, Netflix or whatever, and I am so hungry all of a sudden. I know now to eat a very sustaining dinner and all of that. So, what's an actionable realistic solution to that? Maybe specific snacks or is it a mindset thing? Is there something else to eat or drink? AMANDA: I think that's different for everybody. I think it can be different. Some people literally just didn't eat a sustaining dinner or something and so they truly are hungry. If you're really actually hungry, please eat. Your body's telling you to eat. But it also can be a habit where your body thinks you're hungry because you're used to eating at that time. I think it's just being truly honest and aware. It can take time to change some habits. I guess just be honest with yourself. Here is a good way to tell if you're actually really hungry or not. So, say after dinner kids are going to bed and you're sitting on the couch and you're like, “I really want something to eat.” Ask yourself, “Am I really hungry or is my brain just used to eating something while I'm sitting on the couch?” Because our brain is really good at making us convinced that we're hungry. I always down a huge glass of water. Wait 10 minutes. And then see, so that you can get to know your body, because sometimes you need a brain reset. Like, “Oh, I'm not actually hungry, that's just part of my routine.” Or maybe you are hungry. And if that's the case you can have a treat or whatever, but obviously we don't want to do that all the time because that's when we create those habits and all of that stuff. I'm a big fan of just having something that is going to sustain your blood sugar through the night, so while you're sitting on the couch you don't keep eating. A very practical example, and I have put this on my Instagram feed before, I'll take plain Greek yogurt and I'll put some PFFit which is like peanut butter powder, cocoa powder, and a little bit of honey in there. I'll stir it up and it kind of tastes like you're eating something sweet, like chocolate pudding or whatever. The Greek yogurt has so much protein in there so it fills you up. It sustains your blood sugar through the night, so you're not waking up feeling drained or having weird cravings. If I really want something sweet I go for that, if I feel like I've indulged enough that week. I think it's a lot of just being honest with yourself and having that very unpopular word of being disciplined. It's not a very fun word. We can really be aware of our cravings and our mindset and that is when you have to know you are the choice maker of what you put in your mouth. The food is not your choice maker; you decided to put it in your mouth. And I know that makes food not sound fun or eating not sound fun, but it can be. But when we're trying to shift actual habits, that’s what has to happen. ALLIE: Yeah, I like that. Okay. So, talk to us about Collagen Coffee. I can't have lattes. I can have a little splash of cream in my coffee, but that straight up dairy just wrecks me. I can't do it. AMANDA: I love comforting, warm drinks. I always want to drive through Starbucks and get one of those. Two years ago, I discovered Collagen Peptides, which is a powder form. What I really like about it is it can dissolve in hot or cold liquid. It's also really good for your blood sugar. There is also a lot of research about getting good fats in the morning for your brain and your blood sugar. Collagen peptides have a lot of protein. I do it in a blender. Some people use an immersion blender or a frother and they put it in their mug and do it that way, but I feel like it works better in a blender. Then I put hot coffee, a scoop of collagen peptides (as you're doing this, you're like, this is disgusting.) Then I usually put half a tablespoon of ghee (some people do grass fed butter) and then I do a little Cinnamon for some taste. But the blender action is what gets it that texture of a latte and it gets thick and creamy and a little frothy on top. And it is so satisfying. It's like you ordered a latte in the coffee shop, but you're getting so much nutrients in it. Especially in the morning, you're getting all that good fat in the morning to sustain your blood sugar and it's so good for your brain right away in the morning. Collagen itself, the reason why I am big on it is that it's the most abundant protein in our body, but it's the one that decreases as we age. It's different than if you're drinking protein powder after you work out. Collagen is good obviously for your skin, hair and nails, everyone thinks of it that way. That's probably what you'll notice the change in. But the other stuff that's more long-term is joints, your gut health, and your ligaments. Collagen is what holds our body together and helps it function. Our organs are more healthy. A lot of people say that they feel more energy with it because it helps with energy metabolism. Everyone says they feel like their skin and nails are stronger and their hair is longer, but long-term it has awesome benefits. ALLIE: Yeah, for sure. You turned me onto it last year. I don't know how many bins of that I've gone through, but it's a lot. And it has totally changed my hair; it never falls out. My nails are super strong and long now. And I actually didn't even really think that was why, but now that you're saying it, that's why I've had the best year of nails and skin ever. We’ll link that for you guys. ALLIE: Okay. So, you were the one who also introduced me to the idea of food prepping versus meal prepping, which I always talk about now. I always credit you for it, but I want them to hear it from you. You guys, this is basically the solution for those of us who don't want to pre-decide what we're going to eat. I always would meal prep and then that doesn't sound good and I would literally waste the meal because I go by mood. So, this really helped me. AMANDA: Yes, I'm totally with you on that. Well first, my meal prep is such a good idea and it truly is worth it, but meal prep takes a little bit more time because you have to find recipes. There's more involved. You're going to be eating the same thing every day and some people are totally okay with that and that's great. I'm with you Allie. It depends on my mood. I would make the same thing and on day three I'm like, “that sounds disgusting. I don't want to eat it.” And that's part of it. This is a lifestyle. Enjoy your food. It's really important. So, I started doing food prepping, which I call it compared to meal prepping, because it has cut the time in half or maybe a quarter and it allows me some variety and creativity, which I feel like helps you own your clean eating a little better. I might spend an hour doing this. But you pick two proteins, three to four vegetables sources, and then if you want to go as far as having the elements of a snack ready and then maybe prep a breakfast. But really what I do most weeks is doing the protein and vegetables and maybe even healthy grain like Quinoa rice. For example, I'll bake chicken breast and hard-boiled eggs and those are my proteins. Then I'll roast sweet potatoes and Brussel Sprouts with all sorts of seasonings on it. Then I might make some Quinoa in chicken broth and then I'll cut up raw veggies. Then you have elements of a meal ready. During the week I'll mix and match it. So, one day I'll do the chicken breast, Quinoa and roasted vegetables. The next day I'll do a salad and shred up the chicken with the raw vegetables and a salad. The next day I'll do a snack plate of hard-boiled eggs, raw veggies, hummus and whatever fruit I have on hand. You can get 3-4 different meals. I think over time it helps you own clean eating. It allows you to get creative and to see what you like, what flavors you like together, which ones you don't really care for. ALLIE: I started super basic because I didn't know what I was doing. And I wasn't creative yet. Chicken and hard-boiled eggs, super basic veggies, salad mix and that was it. Now I'm making my own dressings. I can get creative. You want to because you get bored, but you've got the basics down so it's like stacking. You can stack a little bit more. AMANDA: Yeah. If that sounds overwhelming, you can just pick what is your hardest meal of the day. If breakfast is your hardest meal than just prep breakfast stuff. Are snacks really hard for you? Then prep snacks. And then you can build on that too. Part of the food prepping too is I don't prep every single meal because life happens. You might go out to eat one day or you might meet a friend for breakfast, you know? And you don't want to waste food. So, I have the elements available so that I can throw it all together if I need to. ALLIE: Yeah. Would you mind sharing one or two of your favorite prep breakfast ideas? That's a hard one. It's not a hard one for me to make good choices. It's just a hard one for me to think of prep ideas. AMANDA: I think that one was the hardest for me too. I really like overnight oats, which you can prep in a mason jar all together. I have different variations on my Instagram feed, but I like the basic one. It's just oats, banana, almond milk, and Chia seeds. Mix it all and the night before. You mash the banana and then you put the oats in the Mason Jar and the almond milk and Chia seeds. Stir it all together and then you put it in the refrigerator. In the morning you take it out. People get grossed out by the thought of overnight oats because they think of cold oatmeal. But I think with the banana and stuff it makes it more like a pudding-type texture. But I'll add maybe a half a tablespoon of peanut butter and some pure maple syrup for sweetness if you want that. Or some people like to do berries. Literally all you do is put that in the Mason Jar. That saved me, especially with babies, when my littles were really little because who has time in the morning to do that? So that was one of my favorites and it always has been. Another one is that I've shared a lot on my Instagram is a sweet potato egg skillet. All the prep you have to do for that is to peel a sweet potato and shred it on a cheese grater. It makes a lot, but I take about ¼ to ½ of that in the morning, if you have probably 5-10 minutes in the morning to make something. Put a little coconut oil in the pan, throw the sweet potatoes on there and let them get soft and then you pat them down flat and then you crack an egg over it, cover it and let it cook until the egg is cooked to however you like. Some people like it all the way done and some people like it runny. I usually put some salt and pepper in there with the sweet potatoes. But the sweet potatoes get really crispy on the bottom. Lift it with a spatula onto your plate. I call it a sweet potato egg hash. That's one of my favorite breakfasts. ALLIE: That’s one of my favorite breakfasts. I used to get grossed out when Brian would eat it. It’s a bit of a Crossfit-y breakfast because it has all the protein in it. It was always gross to me. I am not a person who likes to mix their foods. But it is probably my favorite now. AMANDA: It's so good. I don't know what it is about those things. It's really simple; there's only three ingredients to that one. And then I have so many smoothie variations, but I really also like making, if I can, as part of my weekly prep, egg muffins. It's pretty much like you are scrambling eggs and veggies in a muffin tin and you bake it. I might do the shredded sweet potatoes and then chopped up spinach with eggs. And then I love nutritional yeast. Nutritional yeast (whether you're dairy free or if you're not) gives a nutty cheesy flavor. 1½ tablespoons has 8 grams of protein, which is insane. It's really good for all sorts of minerals and vitamins. I'll put that in there. Spray the muffin tin and then I'll put shredded sweet potatoes in there and some spinach, whisk up the eggs with all the seasonings and I pour it in the muffin tins, bake it and then you can store those in the fridge. All I have to do in the morning is warm it up. Breakfast is a little bit harder, but those are some of my go-tos. ALLIE: I think some of the breakfast foods that we think of are not very good prepped. I'm not a very breakfast person. Brian gave me two hard boiled eggs on a plate this morning and I couldn't finish the second one. I just don't get hungry until like 10:30. And I just fasted for like eight, nine hours. Like that's terrible. So those little breakfasts are easy for me to just have a little bit and I get something, especially with the Collagen Coffee having protein in it, I guess it's okay if I skip. AMANDA: On that note, the Collagen coffee is bulletproof. I think a lot of people just have that for breakfast because it has a good enough fat and protein for them. But everyone's different. ALLIE: One question that I always get asked whenever I'm talking about eating is about your kids. Do your kids eat what you eat or do you prep for yourself and then make meals for your family? AMANDA: So when I prep I'm usually prepping for a lunch because being a stay at home mom for some reason, lunch is always a crazy time. I'll usually give them some of the stuff I've prepared, especially some of the protein and stuff. At lunchtime we're pretty basic. For example, my oldest did not like sandwiches for three years and he just now likes them, so, yes, you can have a sandwich because this is great and simple and easy. I always tell people don't make it so complicated for yourself. When you see kids eating roasted veggies and stuff for lunch, which I have it all prepped so sometimes I do give them that. But also if they like sandwiches, that's great. Just give them bread that's whole wheat and clean and give them turkey meat that doesn't have all sorts of stuff injected into it. So, lunch is pretty basic. Overall when it comes to eating dinner and cooking, everyone eats what I cook. I don't make a kid-friendly dinner. One: that is super draining, long-term for mom. Dinnertime is already hard no matter if you're just making one meal. And other than that, simplifying it for yourself, make it easier for yourself. My whole thought is kids have to be taught pretty much everything and you have to teach them to love real food because we already get enough opportunities throughout our week to not eat real food. You need to give that to them. Because my kids have cupcakes at school, someone's birthday or we’ll run through Chick-fil-A, or whatever. I'm pretty balanced but I want to teach their taste buds. I want to teach them to try new things and to teach their body to crave real food, and let that be their default. I've realized it has to be the normal in the home for it to be something that's not always a fight. And also, I want them to be gracious where if they're eating at a friend's house when they're older and whatever someone gives you, you at least try to eat it. I feel like I'm teaching. I don't want them to grow up eating a certain way and then have to relearn as an adult, to realize “oh my gosh, I'm eating so unhealthy.” It’s hard enough as an adult to teach yourself how to like certain foods and revamp this whole thing. If I can bypass that hard lesson for them, I would like to, because it's much easier to grow up craving and loving real food than having to do a whole switch-over when they're adults. Don’t take that as, “Oh my gosh, my kid doesn't like broccoli; I'm never giving it to them again.” I think I read one time that it takes 20 times for a kid to try a food to actually form a preference before the age of three. So don't give up, just keep putting it on their plate. There’s going to be things that they may never like and that's okay. Everyone has their preferences, but just because they put something in their mouth, even babies, and they make the most disgusting face, it's not because they don't like it, it's because they've never had it maybe or they haven't learned to have the preference. So, I always make sure to have at least one or two things on their plate I know they're going to eat. So obviously they're eating something. Then we have a rule that you have to have a try bite. And I always say, “You don't have to like it, you don't have to eat more than that, you just have to try it.” And if they put it in their mouth and they eat one bite and don't like that, “that's okay, thanks for trying.” But I'm still going to put it on their plate next time I have it because they may like it one day. So even with our last foster placement. He was so cute. I didn't know how he ate before but probably a month in we were eating some kind of protein and I had broccoli. My boys don't really like broccoli but if we have it, I put it on there. But put it up to his mouth and, poor little guy, he was obviously disgusted by it. And it was really funny. Then a week later I put it on his plate again and he demolished the broccoli and asked for more. So, don't take whatever their first reaction is, don't settle on that because you never know. We have to teach ourselves to form new habits and like things. We've got to do it for our kiddos too. ALLIE: You have given me hope. Hudson is my only one who... how do I say this? He's definitely a foodie. And foods that aren't that good for you. He is always the one who is a little harder to get him to eat things, and we all love asparagus. We have asparagus almost every meal. It's my favorite vegetable. And he won't eat it. Yesterday it was Easter and I was like, “Look, just eat one asparagus stalk and I'll give you a chocolate egg.” But I wanted him to just taste it. He totally did it and I gave him a chocolate egg. Then he asked for another stalk of asparagus and then ate half of it and said he didn’t like it. I'm like, “okay, you tried it though and you ate more.” So, maybe next time. ALLIE: It's so good to hear you talking about this. It's so encouraging and light. I told you guys, she's amazing. Okay, so you are mostly Instagram-based. You don't have a website still? Right? AMANDA: I have a website for the subscription offer and then I sometimes do a blog post on there but it's nothing big. It's just random little things. So most of my content is on Instagram. ALLIE: It's amazing. And you're a mom and you're spending your time in one place and that's you. You don't just have an Instagram that is like a banner that you exist elsewhere. Your Instagram is very full. I go there probably maybe five or six times a week to get workouts. I follow your hashtag. We'll link to all of us for you guys too. But her Instagram is amazing. If you don't have Instagram it is definitely worth downloading just to get on her stuff because you've got those workouts. They're super easy. We've been building a gym in our garage, but I'll come out and I just don't know what to do and so I'll look up something from you and do that. I’ll find new recipes or smoothies and stuff. You lay it all out on Instagram posts. It's just amazing. And then you also have, I have your monthly subscription and it's called A Wellness Note, right? So tell us a little bit more about that if people are interested in that because we'll link to it. AMANDA: I referenced it earlier on, but through this whole process of teaching people and learning about people and how they approach health and wellness, I learned that they were extremely overwhelmed. I like simplified approaches to most everything anyways, but I always wanted to teach a simplified approach to wellness because it doesn't have to be complicated. So there was that. And then also like I mentioned earlier, it doesn't have to be everyone's hobby, but it is your responsibility and having responsibility does require a little bit of knowledge. But we don't have time, or most people don't want to. Health is…I'm interested in it. It's my hobby. I like reading about it, learning about it, it's what I chose my career towards. So I like it, but people don't like it that way all the time and they don't want to spend the time researching stuff. There are so many things coming out of the health world…you need this supplement or whatever. So, I formed what I call a bite-sized health resource and it's a monthly subscription. It's very concise. It's two pages, super easy to read, and I equip the reader with knowledge in order for them to make the best decision for their health journey. I'm not really giving my opinion on things. I'm just giving you the facts about it, teaching you and keeping it really in layman's terms. I could go all medical on people but I'm not going to do that. I don't want it to be overwhelming or intimidating. Like I said, knowledge is power. When you know better, you do better. For example, there's this section called Food Is Fuel on there that says you could just eat healthy, but if you know what that food is doing literally inside your body when you eat it, then you might eat it more and you might actually like it more. ALLIE: It works. It's empowering and it makes me feel smart and like I'm going into this purposefully knowing what I'm eating. I don't feel the way that you feel about health. It sounds awful, but I just don't really care to research. And so I feel like you break it down into a paragraph of that for me. It's exactly what you call it, like a bite size health resource. It's really simplistic and out of all the monthly membership types of things that are out there that I have joined, that I'm a part of now or in the past, this is the most simplistic. I feel like even in my busiest season of life, I could have easily taken this on and been helped by it. It's really easy. AMANDA: Good. Yes. That's exactly what I wanted. I didn't want it to be an extra thing on your to-do list. Like “oh darn, I need to read that”. You could skim through it a little bit and leave feeling like you have a little bit more knowledge in your health, especially with all the opinions and the recommendations for health... This diet or this workout or this supplement. Also, I feel it is helpful to people trying to filter what is best for them is the What The Health section. It’s taking things that are popular, whether it’s micro counting or a supplement that you keep hearing about or a fitness regimen, or whatever. I break it down to what it is and if it's worth it, to say if it's the real deal, if it would be beneficial and why it's beneficial, this is probably for this kind of person or not for this kind of person. ALLIE: It's like the opinion that you Google trying to find. Yeah, it's really good. I feel like every section that you have in there is perfect. It's not too much. It's not too little. It's just enough. It's perfect. Okay guys. Well we will link to Amanda's Instagram and A Wellness Note and all the Collagen peptides. Just go and browse her Instagram feed. It's an amazing resource for sure. Thank you, Amanda, for taking time out of your life to help us and talk to us and encourage us in this important area. I appreciate it. AMANDA: Thank you for having me. I so enjoyed it.